BUY THIS BEAUTIFUL LOG HOME AT A FIRECRACKER PRICE! Home→Announcements→BUY THIS BEAUTIFUL LOG HOME AT A FIRECRACKER PRICE! ← IS A TIMBER FRAME HOME IN YOUR FUTURE? It is July, a time when we celebrate the birth of our nation and many take vacations with their families. But it is also a great time to buy a log home? Why? Well, first we are offering almost $15,000 in savings on one of our Liberty models and, secondly, you can get it built this year! Check out the details below. 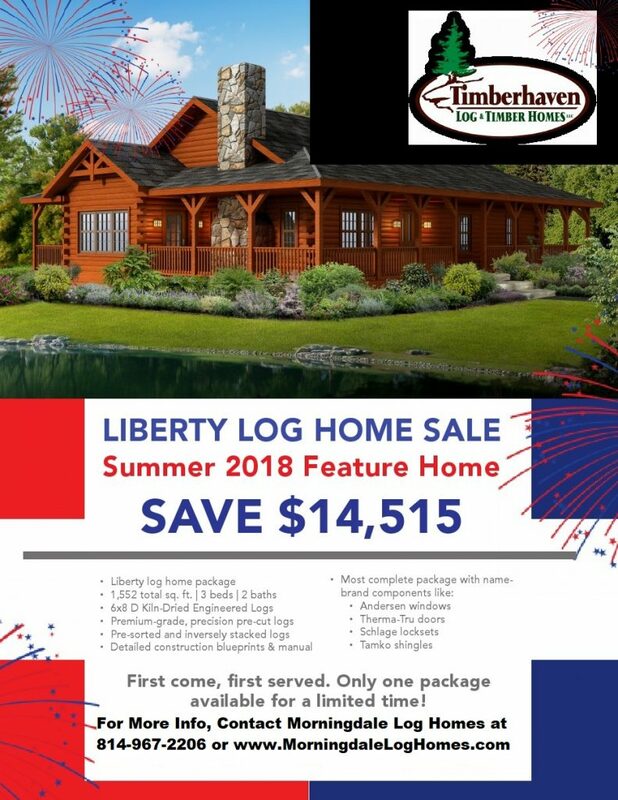 Also, because one of our owners was born on July 4th (yep, he is a firecracker for certain), Morningdale Log Homes is also offering an additional $1000 off! So, if you have dreamed of owning your own log home, do not hesitate to take advantage of this offer as it is only available on a first-come, first-served basis. Call us anytime at 814-967-2206 to take advantage of this offer and become another of our satisfied clients!